At the close of December, the FDA announced its intention to approve AquaBounty Technologies, Inc.’s new animal drug application (NADA) regarding genetically engineered salmon. 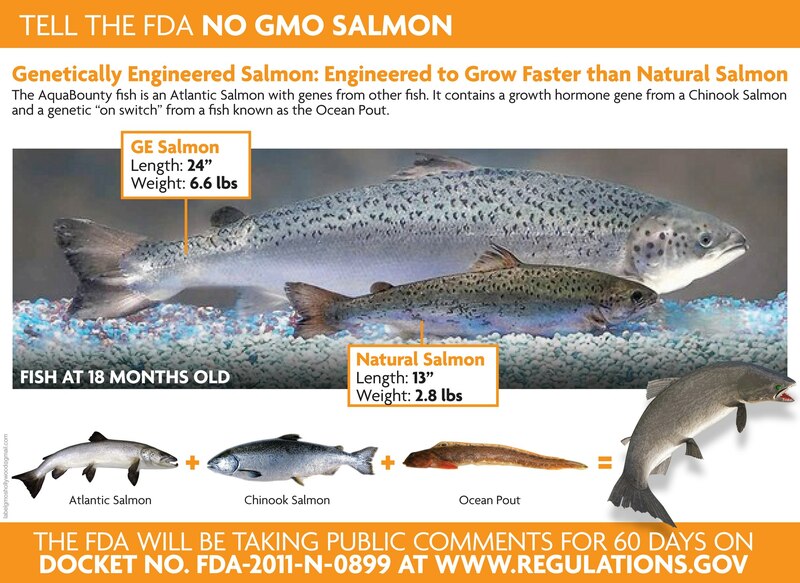 Their claims include the belief that this genetically altered fish is generally regarded as safe (GRAS) because the new salmon is substantially equivalent to wild salmon, generally speaking. The completed environmental assessment revealed little risk according to the proposed conditions as submitted by AquaBounty, receiving a preliminary finding of no significant impact (FONSI) for the stated production. Do you really want to eat Frankenfish? The genetically engineered salmon is comprised of genes from the Atlantic Salmon, Chinook Salmon, and the Ocean Pout, an eel-like fish. It’s engineered to grow faster and bigger, while restricting the ability to reproduce in the wild – lest they escape containment farms. Per the FDA’s status quo, the safety of genetically engineered food for human consumption has not been thoroughly evaluated – and independent studies suggest long-term effects may result in a wide range of illnesses. Despite the public relations spin delivered by the FDA, the Environmental Assessment did reveal slim potential for escape and contamination of wild resources. As usual the responsibility and burden of liability remains on the biotech company behind production. Now ATB has provided assurance in the form of processes that limit this risk: Eggs will be developed in Canada then transported to Panama for grow-out in container farms. Additional electric barriers have been strategically placed to further eliminate this possibility. Although these precautions sound acceptable at first glance, there is always the chance for something to go wrong – and we don’t maintain any control if the management of this process is rooted in a foreign country. The environmental assessment admits that despite all these containment considerations, there is still a 1% chance for escape. In anticipation of concerns regarding transgene contamination, these fish have been genetically altered to make females infertile. However, the environmental assessment also states that there is potential for some AquaAdvantage fish to escape this induction of triploidy, remaining fully capable of reproduction. Although this trait is estimated to be about 99% effective, it is not possible to totally eliminate any possibility. Furthermore, there is little investigation regarding the ability for transgenic mutation to occur through nonsexual means; i.e. second generation consumption by predatory animals and relevant freshwater taxa. Although the biotech industry continues to tell American consumers that there are no defined health hazards associated with the consumption of GMO-containing foods, and that transgenic mutation and contamination are improbable outcomes, we’ve already seen evidence that risk exists. It’s been proven that Mexican corn has been contaminated by GMO varieties – simply from the imported GMO produce entering this country. Now, many corn fields steeped in years of natural heritage are at risk for transgenic contamination; and this is occurring in a country where the growing of GMO crops is banned. We’ve experienced strange anomalies with large populations of bees that feed on BT corn pollen becoming confused and sick from the insecticides built-into the crops actual genetic structure. In Germany the EU court recently backed Bavarian beekeepers who found that their honey contained traces of pollen from BT corn rendering their products unfit for sale. It’s likely that Monsanto and the officials that permitted the experimental GM maize will be held fully liable for the GMO contamination destroying the Bavarian beekeepers’ industry. Finally, when considering risk for a GMO fish, the entire scenario brings to my mind the recent Asian Carp fiasco, which is still being investigated by Congress. (See Bill Summary Here.) Asian Carp originally contaminated the United States through grass carp imports. After numerous floods along the Mississippi River in the late 1990s, officials today are now very concerned that the Asian Carp may ultimately contaminate the Great Lakes, spoiling this renowned refuge of sport and freshwater fishing. They are already spreading and have breached many physical barriers in their steady migration upstream. If you’re still on the fence about eating the new Frankenfish, spend a little time Googling the news on this issue. I think you’ll agree, there are still too many questions and concerns to be evaluated for the FDA to let this cat out of their bag! Now, stand up for yourself and your children and take action to ensure the government won’t continue to walk on us with weak regulations and policy. Sign the Organic Consumers Association petition (Currently possessing 56,386 signatures) and prepare your comments to the FDA. We have less than 60 days to make an impact. Learn more about this here.